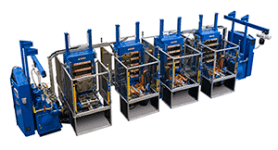 French offers numerous production-improving hydraulic press automation solutions to complement our reliable hydraulic press designs. Whether you want to retrofit your existing hydraulic press or you are in the market for a new press system, French engineers partner with you to understand your processing applications and custom design the best solution for your manufacturing requirements. From individual options such as light curtains, vacuum packages, shuttle systems and loading/unloading systems to complete integrated turnkey systems, French will supply solutions that can increase production, save energy and improve part quality while lowering your operating costs. We offer capacities ranging from 20 ton to 2,000 tons. 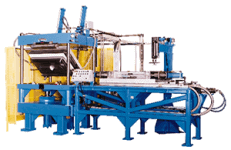 Our commonly requested sizes includes 100 ton hydraulic presses, 1,000 ton hydraulic presses and 2,000 ton hydraulic presses. 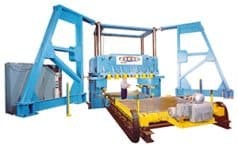 Browse through examples of various hydraulic press designs. 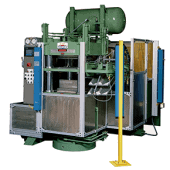 Several years ago, Utex Industries, Inc. in Weimar, Texas approached French® with their need for a new integrated hydraulic press system to mold composite and rubber seals for the oil and gas industry. 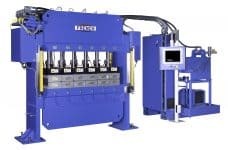 Read how French created an automatic hydraulic press system that needed to allow flexibility in their existing process, increase production and also be adaptable to future business needs.